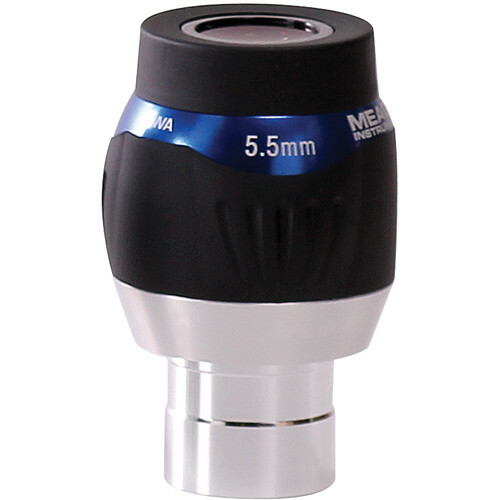 The Meade Instruments Series 5000 5.5mm Ultra Wide Angle Eyepiece has an impressive 82° field of view and comfortable eye relief despite its short focal length, to present users with a comfortable and immersive high-magnification observational experience. Its lens is made in a 7-element configuration with fully multi-coated optics, blackened lens edges, and internal surfaces, to improve color rendition, contrast, and light transmission, while limiting its loss. The 13.2mm eye relief gives users room to back off from the eyecup for a more comfortable viewing experience with a reduced risk of accidental contact with the eyepiece, which can cause vibrations and interfere with views. The eyepiece features a standard 1.25" barrel that is compatible with the most popular size of focusers and accessories. A rubberized textured collar ensures a secure grip when handling it, and its twist-up rubber eyecup enables easy viewing with or without eyeglasses. To make the observational experience more comfortable, Meade engineered this eyepiece to be parfocal with the whole Series 5000 line, so little or no refocusing is required when changing eyepieces. Box Dimensions (LxWxH) 5.7 x 3.45 x 3.45"
Series 5000 5.5mm Ultra Wide Angle Eyepiece (1.25") is rated 4.6 out of 5 by 5. Rated 4 out of 5 by Stuart from Greasy Beautiful, bright sharp image with huge field of view. Good eye relief, but less than the HD-60s. As others have said there is a concerning amount of heavy-grade grease under the twist-up eyecup. There was a ring of it around the lens under the cap. When twisted up, you can see all the grease under there and I'm worried about it smearing onto the lens or worse, into my eye. For this reason I have to take a star. Too bad because the optics are very good for this price point. It should be noted the Meade Series 5000 HD-60 eyepieces do not have this problem and are dry to the touch. Rated 4 out of 5 by velcro333 from Very crisp, nice eyepiece, but greasy I bought this eyepiece for my 8 dob. Views are very crisp to the edge--very nice eyepiece. However, I ran into the infamous Meade grease problem, which almost made me send it back. After weighing quality of the EP vs. cleaning grease off of barrel, I decided to keep it. Very dumb decision by Meade--been complained about for years, but they still feel the need to lather this stuff on the barrel. Anyhow, for the price, it is a very nice EP. Rated 5 out of 5 by Jim from A Gem Every now and then a manufacturer will produce an eyepiece that performs at a stellar level, far below the price point of competing eyepieces. The Meade 5.5mm is such an eyepiece. It is at least as good as a Televue Nagler. In my opinion the Meade 5.5mm ?is more comfortable with better eyerelief and is less blackout prone. I highly recommend this one. Rated 5 out of 5 by dimpbx from Lovely Orion nebula Using an APO 80/480, whether looking at Jupiter or the Orion nebula, the magnification and the field of view match perfectly. Rated 5 out of 5 by Daryl from Superb! Excellent eyepiece for the price! Sharp views, minimal blackout, sensible eye relief, and of course wide field of view. I don't know how well it works on a fast scope but on my f/10 it is excellent.